This performance took place at David Lopato’s fabulous loft in Lower Manhattan as part of his Inhouse concert series where audiences can enjoy music in a warm and intimate setting. David’s exquisite Steinway grand affords pianists an especially good opportunity to present their music. 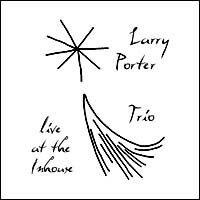 On this evening Larry Porter offered a program of original compositions together with two very creative and versatile musicians, Drew Gress on bass and John Hollenbeck on drums. The trio effortlessly tackles the intricacies of the music and plays with a very intuitive sense of group interaction and breath. Drew Gress is well-known through his work with Fred Hersch, Dave Douglas, Tim Berne, Andy Laster, Erik Friedlander, Marc Copland, and Don Byron. He also is founding member of the cooperative quartet, Joint Venture, and currently leads Jagged Sky, a New York-based quartet performing his original compositions. John Hollenbeck’s work spans a vast spectrum of musical styles. He performs with Meredith Monk, Bob Brookmeyer’s New Art Orchestra, the Cuong Vu Trio, and David Krakauer’s Klezmer Madness. He has also gained recognition for his own musical projects, The Claudia Quintet and Quartet Lucy, which present John’s novel compositional style.